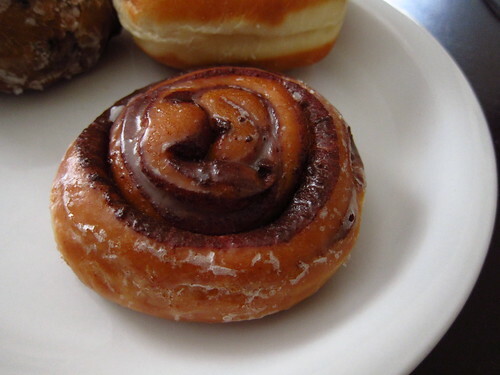 Because let's be serious, doughnuts and cinnamon buns are desserts pretending to be breakfast. Like most people, when I'm on vacation I throw out my usually very healthy breakfast and indulge in such craziness. Thankfully, Lawrence, Kansas is amply equipped with breakfast desserts including FRIED cinnamon buns! All I really need in a town are doughnuts and ice cream. Lawrence has Sylas & Maddy's Ice Cream and they have Munchers,the resident 24 hour bakery. Yes, you can get doughnuts at 2 in the morning. Of course, the best time to go is early morning when the doughnuts are fresh. This time I choose a blueberry fritter and a fried cinnamon bun-I've never had a cinnamon bun done up in doughnut colors before. 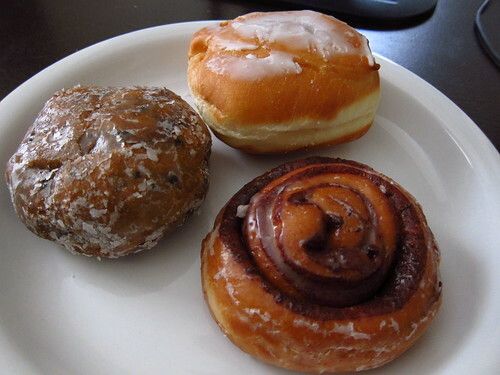 The blueberry fritter is acceptable, not as good as their apple fritter in my opinion. The fried cinnamon bun was definitely for the win. The glazed exterior and soft buttery cinnamon interior is the thing dreams are made of. 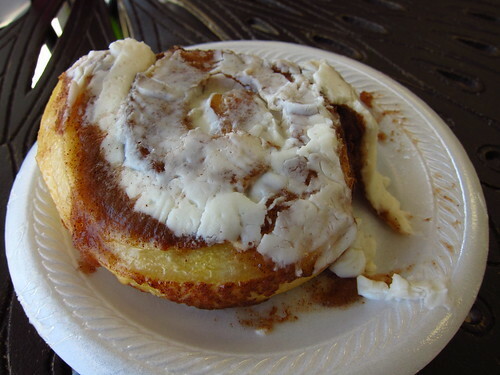 That wasn't the only great cinnamon bun I had out there, Auntie Em's Deli & Bakery makes theirs fresh every day. I can verify this because not only were they discussing making tomorrow's dough while we ate ours there, the bun itself was still soft and chewy. Gooey, sweet cinnamon goodness made with love and care. Yes, the looks of it made someone start eating before proper documenting had occurred!